• He began Sunday morning dealing with correspondence from Supervisor Susan Adams and the county administrator. • From 1:30 to 2:15 p.m. Kinsey met with the East Shore Planning Group in Marshall to discuss pending changes to the Coastal Plan. • At 2:45 p.m. he was interviewed by Lynn and me. • From 5 to 7 p.m. he would be at a campaign fundraiser in the San Geronimo Valley. Supervisor Kinsey at the Will Lafranchi Ballfield in Nicasio Square. Kinsey said that although campaigning makes his tight schedule even tighter, he generally needs to work nonstop anyway. A county website says that besides his being the president of the Marin County Board of Supervisors, Kinsey is an appointed member of 28 public commissions and committees. He is the chairman or president of 13 of them. Kinsey said he gets so many “leadership positions” because “I work hard.” The committees and commissions range from the California Coastal Commission, to the Marin County Open Space District, where he is president of the board of directors, to the Marin County Transit District, where he is also president of the board. Among his other responsibilities, Kinsey is chairman of the county Flood Control District, serves on the Labor Relations Committee, and is chairman of the Board of Supervisors Budget Committee. Not only does he attend endless public meetings, he appears in many parades and other public events in his district. He spends time helping nonprofits like the Dance Palace raise funds. He goes to funerals and memorial services. He takes part in dedicating public facilities. Would he describe what all this requires? Kinsey responded by reading his schedule from the past week. • 8 a.m. Transit District meeting. • 10 a.m. Meeting with the general manager of the transit district. • 11 a.m. Meeting with Marshall dairyman Albert Straus, who is interested in moving the dairy’s processing facility from Petaluma back to West Marin. • Noon. Meeting with county staff regarding the Coastal Commission. • 1 p.m. Meeting with the county grand jury regarding the county budget. The supervisors’ budget hearings were about to begin. • 2 p.m. County Transit Authority meeting. • 4:30 to 6 p.m. A campaign fundraiser. • 7:30 p.m. An air quality meeting in the San Geronimo Valley regarding woodsmoke. • Kinsey flies to Ventura County for a three-day Coastal Commission meeting. 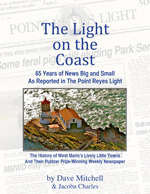 • 8:30 p.m. Gets back home and writes a guest editorial for The Marin Independent Journal. • Early morning meeting in Bolinas to discuss configuring two parcels of land so they can’t be subdivided and will permanently remain in open space. • 11:15 a.m. to noon. Interviewed on KWMR. • 1 to 3 p.m. Attended a funeral in Novato for Chuck Bennett. • 3:30 p.m. Went to his office in Civic Center, which he had been away from for five days because of the Coastal Commission meeting. • 4:30 to 6:30 p.m. Attended a campaign committee meeting. One of the main requirements, Kinsey noted, is dealing with the 60 to 100 email messages he receives daily. The supervisor said he writes replies to all messages from his constituents, so he must spend one to two hours a day handling email. Kinsey, 59, of Forest Knolls has lived in West Marin for 35 years although his biography on county website says 22. It also says that Kinsey’s 27-year-old son Breeze is 15. Kinsey’s Fourth Supervisorial District includes, along with West Marin, western Novato, part of San Rafael, part of Larkspur (including San Quentin Village), part of Mill Valley, and all of Corte Madera. His opponent Diane Furst is vice mayor of Corte Madera, where she is in her first term on the city council. Furst has lived in Marin County for eight years. Kinsey’s main criticism of Furst is that she lives in East Marin and lacks his familiarity with West Marin issues. If she were to be elected, West Marin would have no representation on the Board of Superviors, he stressed. It would also lose its representation on the Coastal Commission. He added that his knowledge of West Marin issues, as well as other issues that county government deals with, has in large part been acquired during his 16 years in office. Kinsey had taken part in a number of civic groups before first running for the Board of Supervisors in 1996, the county website reports. For example, he had been chairman of the Marin Conservation League Water Committee from 1989 to 1996 and received two awards from the League in 1992. His original decision to run for the Board of Supervisors was not made quickly. “I wore a ponytail for years so people wouldn’t ask me to run for office,” he said with a chuckle. Yet here he is after four terms in office, clean-cut and running for a fifth. Agriculture in West Marin faces many challenges. In the Point Reyes National Seashore, a mushrooming herd of tule elk is the most recent, reporter Axelrod noted. I asked how committed Kinsey is to keeping the ranches in the park operating. “One hundred percent,” the supervisor emphatically replied. Kinsey himself faces some challenges going into the June 5 election. Although 85 percent of his supervisorial district lies in West Marin, where many of his most-active supporters live, 70 percent of the district’s voters live in East Marin. At the moment, organizing support over the hill is a focus of his campaign. Sparsely Sage and Timely is powered by	WordPress 4.9.10 and delivered to you in 0.372 seconds using 52 queries.